Into the early 20th century, the area at the end of Oakvale Avenue, where the Gardens are now located, was a ravine that formed part of the watershed of Hastings Creek. 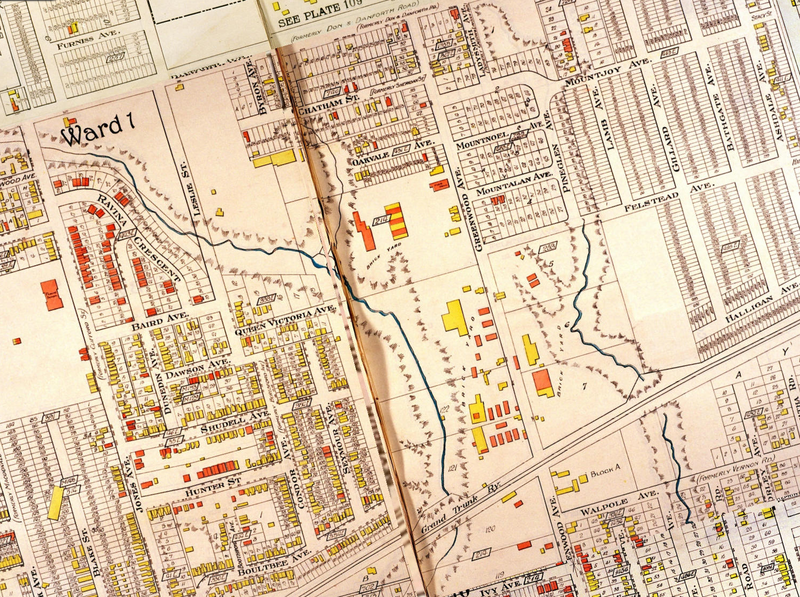 To the south, where the Toronto Transit Commission (TTC) yard is now located (completed in 1966), was one of several brickworks in the immediate area (see historic image of 1913 above). At some time between 1925 and 1940, the site was used as dump, known as Greenwood Fill or Harper’s Dump. 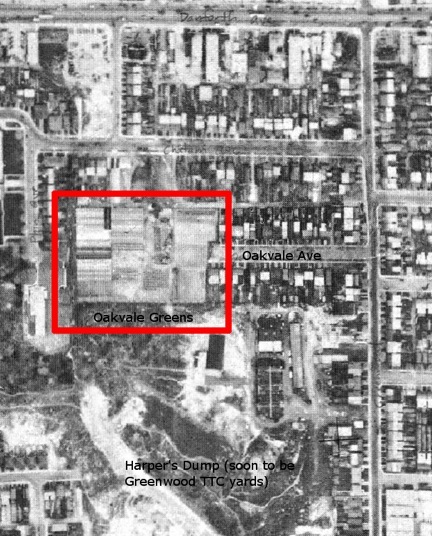 During this time, and up to some time around 1950, the Oakvale Greens area was used for fruit and vegetable growing. In the mid-1980s, the TTC came to the residents of Oakvale Avenue (see on Google maps), a short dead-end street, to inform them that the TTC was proposing to build a 250-car parking lot at the end of the street. The TTC also wanted to put in a fenced laneway running north/south between Chatham and Oakvale avenues. Questioning why the TTC needed to build this parking lot, the area residents formed the Oakvale Avenue Residents Association (OKRA) to challenge the decision. OKRA persuaded the City of Toronto Committee of Adjustment to not allow the parking proposal. In return for building a 63-car parking lot, the TTC was to “green” the remainder of the land now known as Oakvale Green — the OKRA lands. In 2006 it was decided that if the area was to move forward in remediation and improvement that the TTC and OKRA should enter into a formal agreement on how the area would be used (see the TTC’s “Property Agreement: Greenwood Yard — Oakvale Residents Association“). A Memorandum of Understanding was signed allowing the OKRA lands to be used for “public recreational use” and gave OKRA planting rights. At that time, about five small gardens and 14 fruit trees were introduced into the area. In 2008, the TTC formally ceded the “community” plots to OKRA for stewardship. 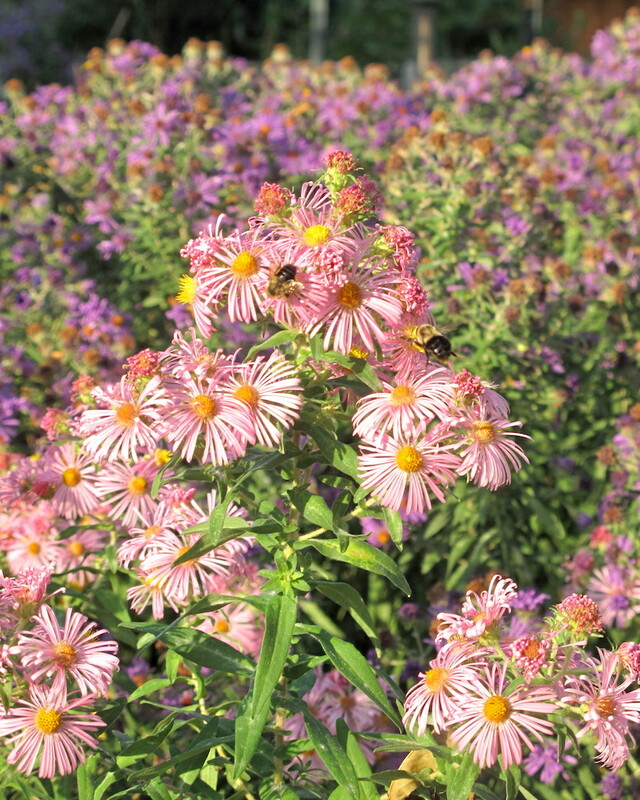 The Gardens are therefore unique in that they are run solely by volunteer members and are not involved in the City of Toronto Community Gardens Program. It is also the first space in Toronto on public/private land to have been planted successfully with fruit trees, reviving the long-standing local tradition of fruit and vegetable growing.